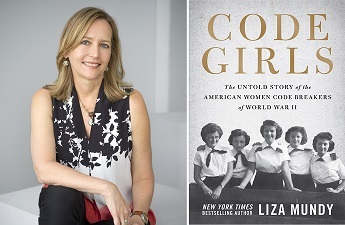 CODE GIRLS: THE UNTOLD STORY OF THE AMERICAN WOMEN CODE BREAKERS OF WORLD WAR II by Liza Mundy. Published October 10, 2017 by Hatchette Books. The women came from all walks of life. Farm girls, city girls, teachers, librarians, college students and graduates, Master’s students and PhD professors, and some telephone operators. Most often, they were referred to as Code Girls, and it would become their primary job to break Japanese and German military and diplomatic ciphers, along with codes from a host of other countries. And they did it. They broke the German four wheel enigma code. They broke Japan’s JN-25 code, which proved to be a real boom for the Navy. The Japanese Navy really appreciated punctuality, and Imperial Japanese Commanders liked to inform people exactly when their ships would arrive at a certain place on the high seas at noon. American submarines would be waiting to greet them, thanks to the Code Girls. The Code Girls also told American naval personnel when Midway was about to be attacked, and the United States Navy was waiting, and prepared. The Code Girls’ biggest coup during the Battle of the Atlantic was when they broke the four wheel Enigma code. American ships were being sunk left and right by German U-Boats. After the code was broken the shipping convoys were better protected, the U-Boat fleet was virtually destroyed, and Admiral Donitz was apoplectic. What makes CODE GIRLS all the more interesting is author Liza Mundy’s stories of the women. We are reminded that they were not machines, they were human beings, with husbands, sons, and brothers in the service. We feel the drama of women who were cracking messages from far away places, where their loved ones were locked in fierce struggles for land and sea. Occasionally, these women were the ones receiving Western Union telegrams, notifying them that a loved was missing in action or had been killed in action. They experienced it all. They knew that the lives of millions of men hung in the balance, and their work was very important in bringing home safely as many of those men as possible. They experienced the joy of being the first to read the messages announcing the surrendering of Germany and Japan. They wondered aloud about Hiroshima and Nagasaki. They had fun. For most of them it was the first time they had been more than a few miles from home. They fell in love with co-workers. They fell in love with soldiers they corresponded with and never met until the war was over and the men came home. Some of them fell in love with each other. Liza Mundy’s book is a terrific example of what can be done through persistence and excellent research. Many of the records related to the work are still classified, and Mundy’s dogged pursuit of information through Freedom Of Information Act (FOIA) requests and interviews with some of the surviving women, along with a beautiful narrative style, makes CODE GIRLS both easy and enjoyable. Most of them have passed on now. CODE GIRLS reminds of a time when we all came together, for the greater good. This is a story that needed to be told, and these women need to be remembered. Liza Mundy has gone a long way to accomplish that.